Working with Dr. Erika Bourguignon was a significant turning point for Cuyamungue Insitute’s founder, Felicitas Goodman. In 1973 Felicitas worked with Erika on a comparative study of 488 indigenous societies around the world. They found that 90 percent used at least one culturally institutionalized method to experience an altered state of consciousness. This became a significant clue that launched Felicitas on the path to re-discover the ritual postures. Erika examined possession, altered states of consciousness, religion, psychological anthropology, and shamanism. She focused on possession trance states, a “dissociative” state where seemingly the trancer ‘left the body’. Felicitas on the other hand shifted her focus to what she termed “ecstatic” trance, a very different experience upon which the Cuyamungue Institute’s work is based. In the finding that Felicitas was following the trail to that state of expanded awareness in which the doors of perception were thrown open to a wider realm, all the while firmly anchored in this realm. We may stand with full awareness in this realm while we journey through the parallel realm, the “alternate reality”. That’s the innate gift of our physiology – that we can be simultaneously in both. Our brains find “beta/theta” healing and enjoyable, not a strain. This lead to the conclusion that alternate states of consciousness are entirely normal. “Erika Eichhorn Bourguignon, 90, died in Columbus, Ohio, February 15, 2015. She was Professor Emerita of Anthropology at Ohio State University, where she taught for more than 40 years. She is best known for her contributions to psychological anthropology, anthropology of religion and anthropology of women. Born in Vienna in 1924, Bourguignon arrived in the United States with her parents Luitpold and Charlotte Eichhorn in 1939. She held a B.A. from Queens College, N.Y.C. (1945), and a Ph.D. from Northwestern University, Evanston (1951). At Queens she discovered anthropology, working with H. Powdermaker. At Northwestern she was greatly influenced by A. I. Hallowell and M. J. Herskovits. Bourguignon conducted fieldwork among the Chippewa in Wisconsin (1946) and in Haiti (1947–48), where she met her husband, Belgian writer and artist Paul-Henri Bourguignon. She published seven books and more than eighty professional articles. Arriving at Ohio State University in 1949, she was a founding member of what would become the Department of Anthropology. She led the Cross-cultural Study of Dissociational States (1963–68) under a grant from National Institute for Mental Health. 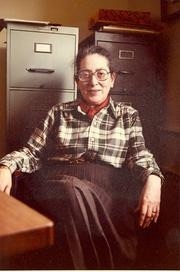 In the early 1970s, Bourguignon taught the first course on the anthropology of women at the university, chaired a newly formed Council on Academic Excellence for Women and, in 1971, became the first woman to chair a department in OSU’s College of Social and Behavioral Sciences. After retirement from full-time teaching in 1990, she published, with Barbara Rigney, “Exile: A Memoir of 1939″ by Bourguignon’s aunt, Bronka Schneider. Bourguignon maintained her interest in Haiti, writing and lecturing on the subject. She also worked actively to promote the artwork of her late husband, Paul-Henri Bourguignon.